Mangorewa Gorge is a beautiful place to climb, with relatively long routes for ignimbrite, which is of relatively good quality here. 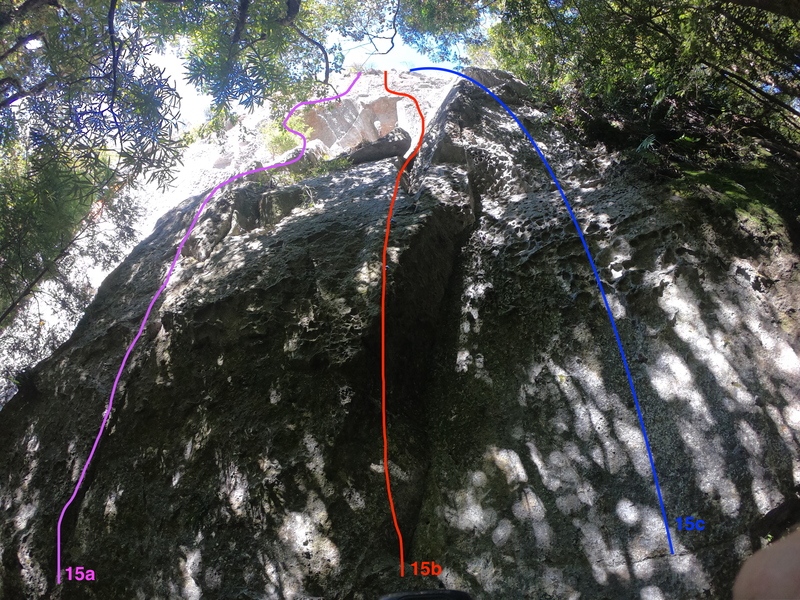 The climbs are well protected with glued in stainless steel bolts.These are new climbs done since the publication of the Rock Delux North guidebook (NZAC 2015), and are referenced to the climb numbers in that guide, and those original climbs are not included here. It catches the sun but often wet in winter. See Rock Delux North Guide. Access from SH36 road, between Tauranga and Rotorua. Park at the bottom of the Mangorewa Gorge Scenic Reserve area at the carpark or other pull outs. Walk towards Tauranga, to just before a bridge crossing a subsidiary stream. Between two 35 speed signs walk down the right side of the stream on a defined track through scrub towards the river. At the river level cross this stream and walk down the river for 20 mins or 1.5km. Be careful of slippery rock, and only if it has been fairly dry (not usually good access in winter). The crags are obvious at river level on the right. Preferably a Track has now added through the bush so you can avoid the river walk. Cross the river above the stream and onto a rock ledge. Currently from the down stream end of the ledge wooden stairs lead to a Track marked with tape all the way to the Bush Wall. About two thirds of the way to Bush Wall the track reaches just below the left end of the Wonder Wall (by Appetite for Destruction). Left of Wingsuit is a line of bolts to a lower off. Line of bolts right of top pitch of Chuffa Chuffa, off the access chain. Climb the wall and bulge. Next right line of bolts. Start up a groove and then a series of bulges, to lower off. the line of bolts left of Potomania. A hard start up a bulge to crack line, or move across from Potomania. Climb up into the left facing corner and over a bulge on the right to finish. Lower off. Starts 2m round the corner to the right of Breezeblock. Climb the lower wall into the cave feature and up the right side of a sharp ridge to the overhang. Climb leftwards through this along the handrail, then up to anchor. About six meters right of Breeze Block, accessed by following a track from the terrace and right through the bush (looking in) to a cleaned and bolted groove line. Climb the groove (faces right), moving left to another groove and onto a balanced block. Climb the slabby wall then follow the featured rock up the right edge of the cave and then up to steeper ground to the chains. To improve rope drag on this route extend the ninth bolts with a 60cm sling, and 30cm on the seventh. Start up the face a couple of metres right of GTP, and up the scooped groove and over the bulge to a slab and ledge. Then climb the featured rock rightwards, and then back left through featureless bulges (crux), to the chains. The first ascentionists exited with a head torch up the river on Remembrance Day. Original start shared with GTP. A bolted line right of Sexual Camping, with hard moves through the initial overhangs. Bolted line right of Sexual Camping. Burly moves through the hanging block in the roof. A direct line to Drag Queen. Brilliant line with technical start and then over bulge. Easier groove leads to brilliant climbing to the chains with sting in the tail. Start right of the prow right of AoD, to chains on ledge two thirds up. Hard project above. This area is 30m right of Wonder Wall, through the bush. Start up dirty roots for a couple of meters. Climb left to tricky reddish groove, to easier ground, then the final steepening groove to DBCB. The rock degenerates above. Climb left of first few bolts and right of the last few. Start as BaC, up the access rope, and up the right hand groove. Traverse left then the crux is moving back right onto the headwall, leads to DBCB. Wonderful sunset.